I have made block A03 three times. I was unhappy with the first attempt, the second one was no better, and today I decided to make it again. After trying a very complicated method for attempt two I went back to good old needle turn applique. But this time using freezer paper. Freezer paper is great. I had never used it until now. I cut out the shapes and pressed it to the fabric and cut around leaving 1/4 in seam allowance. Instead of using a compass to trace the circle, I first pressed the square, which I cut 1/2 in larger, in the diagonals. Then with a ruler and a water soluble pen I marked 4 dots, barely visible in the picture, 1 1/4in from the centre on each four sides. Then I marked the middle of the melon as per picture below. I put a needle through both the melon mark and the dot in the background square. Then make sure that the melon is perfectly in parallel with the top edge of the square. Then and pin each corner on the diagonal line as per picture below. Do this with all melons making sure that all melon corners touch. It looks like a lot of pins but that was the best way I could come up with to ensure I was ready to baste. I then basted on the outside circle. I didn’t realise then but I do now looking at this picture where I went slightly wrong as the bottom melon outer edge doesn’t align to make a perfect circle. To start, I folded the seam under the freezer paper on both corners and finger pressed as per picture. So far so good. I was quite happy about what I was seeing. I spent quite a bit of time pulling the fabric under the freezer paper to remove tiny fabric folds in order to obtain smooth sides. This is done a lot easier if using freezer paper. As you can see the outside seam looks a bit wider than the inner seam. 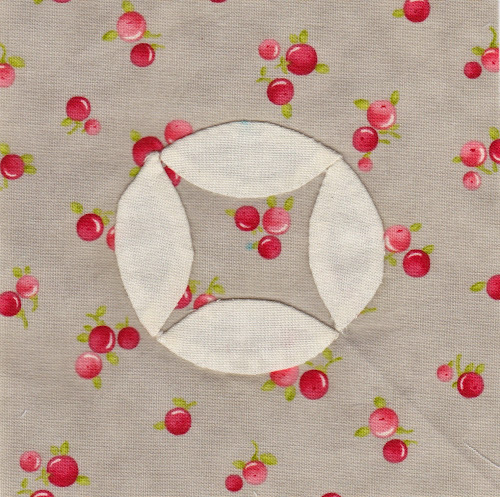 I cut it intentionally wider because I intended to do reverse applique for the circle. But then I changed my mind and thought that I’d do the whole thing using needle turn applique. So I trimmed the excess seam. And did stitched around the circle. When I finished, I made an incision on the back of the melons and I removed the freezer paper. I think this is it for A03. You obviously have a huge amount of patience and determination. Well done for persevering. Thanks Bossymamma, I do have a lot of determination. i’m gkad you noticed. LOL. I think you did a very nice job! I like it. Thank you so much for your help. Iv’e been struggling with this one. It’s done.